Bromo Ijen Tumpak Sewu Tour 5D4N its the program good for the travelers who have a short time for adventure in East Java – Indonesia. So, they have make everything little bit rush but it’s worth it. 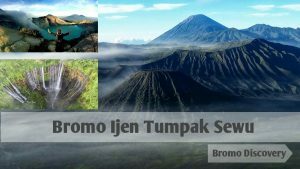 Mount Bromo, Ijen, Tumpak Sewu Waterfall are the 3 most amazing places that you will visit. Early morning wake up! By jeep 4 wheel-drive we drive you up to Mount Pananjakan (2,770 M asl) for a spectacular view of sunrise over Mt. Bromo and its desert. From Pananjakan we crossing the Bromo’s desert to Mount Bromo then continued return to hotel for shower and breakfast. About 10.00am we can check out, After that by air-conditioned car we will driving in about 4,5hours journey to bondowoso stay at Ijen View or Palm Hotel. We will Stop at local resto Handayani to have lunch and relaxing. From day2 At 11.30pm, we will start driving a short way to the pal tuding and then start trekking about 2 hours to get the summit and walking down to the blue acid lake the search and get the spectaculer of blue fire. After That, we leave Ijen plateau and drive to lumajang Hostel about 4h check in and rest. Wake up in the morning about 8am after breakfast we will visit tumpak sewu waterfall from parking area start trekking about 2-3km going down to see beautifull of waterfall than visit Tetes Cave when enough time before we going journey drive about 3h to Malang hotel before check in we will visit rainbow house check in and rest. We will do city tour or massage when enough time. At about 9am after having breakfast from hotel we will visit rumah pohon and possible we do paragliding (paragliding fee pay by own) and visit Coban Rais flower Garden than drive continue to surabaya Airport/Hotel drop off and program Bromo Ijen Tumpak Sewu Tour 5d4n finish.